You have made the bright decision to collect stamps. The question is, how are you going to collect? What are you going to collect? Perhaps the best thing about stamp collecting is the nearly infinite number of ways you can collect. The tried and true method of collecting by country or region is still very popular. You can collect by time period, stamps from the 19th century or you can collect stamps by color, I’ve seen a collection of all red stamps! Today one of the most popular methods of collecting is Topical or Thematic. A topical collection would be something that collects stamps based upon the subject of the stamp, like football on stamps or architecture on stamps. 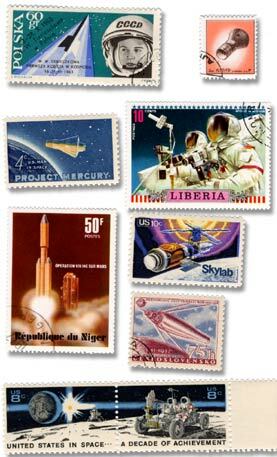 Shown at left are several stamps from several different countries issued at different times. The one common theme in all of them is that they all have space exploration as their subject. From early space shots to Mercury, the lunar landings and Skylab in the early 70s, all these issues have space as their topic.